When referring to rotary dryers, it’s usually safe to assume that a direct-fired rotary dryer is the topic of discussion. Direct dryers are used more frequently than their indirect counterparts, because of the efficiency they offer. And while direct fired rotary dryers are most often the selected drying method, indirect rotary dryers are a valuable alternative for specific processing needs. While both types of dryers are comprised of a rotating drum in which the processing occurs, these two types of dryers utilize very different methods to process the material. Direct-fired dryers rely on direct contact between the material and process gas to efficiently dry materials. Efficiency is further increased by the addition of lifting flights affixed to the internal walls of a direct rotary dryer. These flights lift the material, carrying it over and cascading it through the stream of process gas, in order to maximize heat transfer between the material and drying medium. It avoids the issue of fine materials becoming entrained in a process gas, which can be a problem when processing fine materials in a direct dryer. It allows you to tightly control the processing environment, an ideal characteristic when working with materials that can be combustible in certain settings, or, when the material to be processed cannot come into contact with process gases, such as when processing food-grade materials. Indirect dryers rely on the heat emanating from the drum’s shell to dry the material via conduction and radiation. Subsequently, indirect dryers would not benefit from the addition of lifting flights, since there is no process gas moving through the drum. Furthermore, because the furnace exhaust is kept separate from the process gas, indirect dryers have the added benefit of requiring less exit gas treatment. 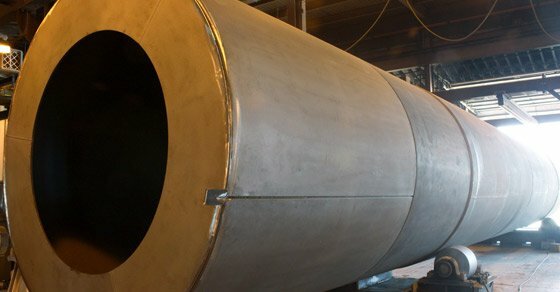 Unlike their direct-fired counterparts, which are typically constructed of carbon steel, indirect-fired rotary dryers are constructed using a high temperature alloy, in order to maintain the integrity of the drum, despite the constant exposure to high temperatures that the shell must endure. Direct fired rotary dryers account for the lion’s share of bulk solids drying applications, and are used throughout a multitude of industries, including fertilizer and agriculture, mining and minerals, specialty chemicals, and more. They offer heavy-duty processing and consistent reliability. Indirect-fired rotary dryers are better suited for niche applications. Indirect-fired dryers are ideal for processing dusty, fine materials, or materials that cannot be exposed to oxygen or combustion gases during processing. This is commonly seen with food grade materials, highly combustible materials, organics such as grains and pulps, and fine materials such as pigments. FEECO has been a leader in the field of thermal processing for over 60 years, providing both direct and indirect rotary dryers to meet the varying demands of a wealth of industries. For more information on direct or indirect rotary dryers, contact us today!